FREMONT, Calif.--(BUSINESS WIRE)--Accell, a provider of innovative Powramid power products and enhanced connectivity solutions, today announced the release of its new USB-C VR Adapter. Having received Oculus Ready certification, Accell’s new adapter comes just in time to make for an ideal accessory for the Oculus Rift, providing users with one of the best high-end VR gaming experiences available today. 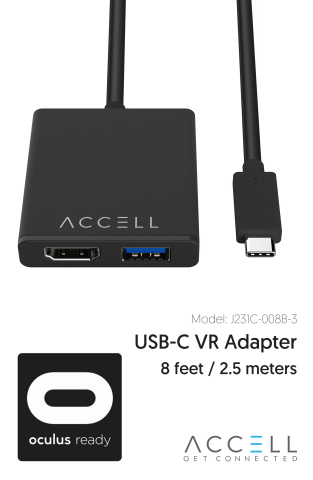 Accell’s USB-C VR Adapter, model number J231C-008B-3, integrates USB-A 3.0 and HDMI 2.0 connectors into one single USB-C connector, combining power, display and bandwidth into the easiest way to enjoy ultimate VR experience. This is the first Window Platform Type-C to HDMI Adapter with a built-in eight ft. cable, providing users with an extended freedom of movement in a typical room measuring 8x8 ft. Featuring a USB-C single cable reversible plug, Accell’s adapter supports 4K and is plug and play ready, providing an easy setup with no installation required. For use with laptops, computers equipped with NVIDIA RTX GPUs are recommended for best performance. Accell’s VR adapter is an ideal Oculus Rift accessory and is available for purchase at Accellww.com and Amazon.com for a suggested retail price of $49.99. For more information, please visit https://www.accellww.com. Built on a customer-centric and technologically advanced foundation, the Accell brand is focused on providing quality products and value to its customers. The company’s product lines span various categories, including innovative Powramid power products, enhanced connectivity solutions, and Accell’s new Thunderbolt 3 series line, as well as the first model AxFAST LEVEL 2 16A EVSE Electric Vehicle Charger. Based in the heart of Silicon Valley, Accell has global research and design teams, as well as manufacturing facilities in Mexico, Malaysia, and China. Its factories are certified to the ISO 9000 standard, and its new state-of-the-art facility in Kunshan, China has earned QS-9000 and ISO-14000 certification. With a large group of dedicated scientists, design engineers, and experienced sales and marketing professionals, Accell is quickly becoming a world leader in delivering high-quality and affordable connectivity products. For more information, please visit our Web site at Accellww.com. Accell’s new adapter is the ideal accessory for the Oculus Rift, providing users with one of the best high-end VR gaming experiences available today.